What Is the Best Time to Read to Your Child? Your parents may have read aloud to you before bedtime, and your grandparents may have read aloud to your parents before their bedtime, but have you ever wondered about the benefits of all of that reading aloud before bedtime? Is bedtime the best time for reading to your child? At what age should you start reading to a child? 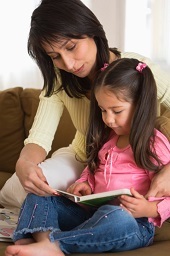 What is the most beneficial time to read to your child to facilitate word retention? So, rather than handing your infant or toddler a smart phone to play with, take time to read to your child. Whenever possible, do so before afternoon naps. By starting this practice early and building it into a fun and anticipated tradition, your child will gain benefits that last a lifetime. According to the American Academy of Pediatrics, it’s never too early to start reading aloud to your child. As soon as your child is born, you can and should begin the practice, so that you and your child can become absorbed with books. Reading aloud to your child not only creates a bond between the two of you – which is a side benefit – but it gives your child an important advantage. By age 3, children who have heard fewer words – whether though reading, talking or singing – may be at a disadvantage compared to children who have heard a greater number of words, and which may lead to a disadvantage in school. That was the finding of a study, “Meaningful Differences in the Everyday Experience of Young American Children,” conducted by Betty Hart and Todd Risley. Do you and your child have a favorite selection of children’s books that you enjoy reading aloud together before naptime? Share your happy tales with us on our Facebook page.